We are pleased to announce the general availability of FreeNAS 11.2-RELEASE. This release represents a significant development and testing effort. Existing users are encouraged to read these Release Notes thoroughly, including the Updating Recommendations section, before updating to become familiar with the potential impacts of the update. New users are encouraged to install this release in order to take advantage of the many improvements and bug fixes introduced in 11.2. As always, please report any bugs to https://redmine.ixsystems.com/projects/freenas/. To update to this release, select the 11.2-STABLE train in System → Update. To install this release, refer to https://www.freenas.org/download/ for installation instructions and to download the installation file. The login screen defaults to the new, Angular-based UI. Users who wish to continue to use the classic UI can select “LEGACY WEB INTERFACE” in the login screen. Beginning with this release, there are two published versions of the 11.2 User Guide: one contains the screenshots for the new UI using the default dark theme and the other contains the screenshots for the legacy UI. The availability of both versions of the Guide is to assist users as they become familiar with the new UI during the transition period before the legacy UI is deprecated in a future release. Both versions contain a menu selector, making it easy to navigate between different versions of the Guide. The rewrite from the old API to the new middlewared continues. Once the API stabilizes and the rewrite is complete, api.freenas.org will be deprecated and replaced by the new API documentation. In the mean time, to see the API documentation for the new middleware, log into the new UI, click on the URL for the FreeNAS system in your browser’s location bar, and add /api/docs to the end of that URL. The boot loader has changed from GRUB to the native FreeBSD boot loader. This should resolve several issues that some users experienced with GRUB. GRUB was introduced as a temporary solution until the FreeBSD boot loader had full support for boot environments, which it now has. The Plugins and Jails backend has switched from warden to iocage and warden will no longer receive bug fixes. The new UI will automatically use iocage to create and manage Plugins and Jails. Users are encouraged to recreate any existing Plugins and Jails using the new UI to ensure that they are running the latest supported application versions. Virtual Machines are more crash-resistant. When a guest is started, the amount of available memory is checked and an initialization error will occur if there is insufficient system resources. When a guest is stopped, its resources are returned to the system. In addition, the UEFI boot menu fix allows Linux kernels 4.15 and higher to boot properly. Cloud Sync Tasks provides configuration options to encrypt data before it is transmitted and to keep it in the encrypted format while stored on the cloud. The filenames can also be encrypted. Additionally, support has been added for these providers: Amazon Cloud Drive, Box, Dropbox, FTP, Google Drive, HTTP, Hubic, Mega, Microsoft OneDrive, pCloud, SFTP, WebDAV, and Yandex. Support has been added for Self-Encrypting Drives (SEDs). OpenZFS is up-to-date with Illumos and slightly ahead due to support for sorted scrubs which were ported from ZFS on Linux. Notable improvements include channel programs, data disk removal, more resilient volume import, the ability to import a pool with missing vdevs, pool checkpoints, improved compressed ARC performance, and ZIL batching. Note that many of these improvements need further testing so have not yet been integrated into the UI. While most updates “just work” it is possible that certain hardware or software configurations will experience issues. This section summarizes common issues and how to resolve them. Before updating, save a copy of your configuration: System → General → Save Config. If you really care about your existing boot environments (many users don’t), replicate them to another system. It is possible that the copy operations from the update stressed the boot device, which is rather common for USB media. To test this, perform a fresh install of 11.2-RELEASE on a new boot device. If that succeeds, restore your saved config. If a fresh install fails, try it one more time while selecting the other option in the Boot Mode screen of the installer. In other words, if it failed with the UEFI option, try the BIOS option and vice versa. If that install works, restore your saved config. If the fresh install still fails, perform a fresh install of your previous version (previous versions are available from https://download.freenas.org/) and restore your saved config. This will bring the system back to its original version and configuration, before you attempted to update. Then, go to System → Support and open a ticket so a developer can help determine which hardware is preventing the system from booting. 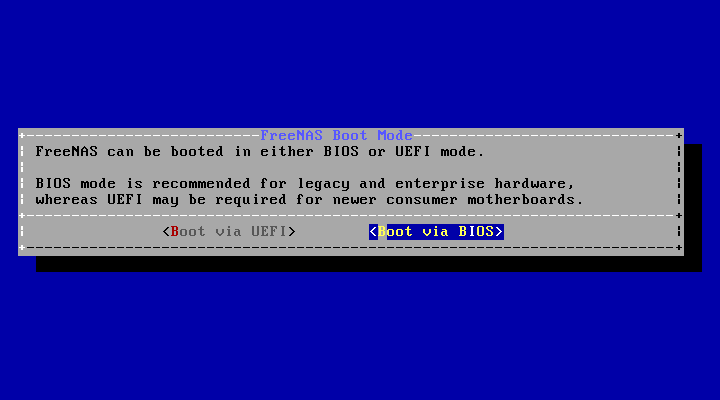 Will I ever want to boot into an earlier version of FreeNAS? Will I ever want to use these storage disks on another operating system that supports OpenZFS? Until you are sure that the answer to both questions is “no”, ignore (or dismiss) the alert and do not update the pool. Existing warden (legacy) plugins and jails must be managed while logged into the legacy UI. Since warden plugins/jails are now deprecated, the install and update functions have been disabled in the legacy UI. However, you can continue to start and stop plugins/jails, access their shell, and manage their mount points. Warden (legacy) jails/plugins created in earlier versions and iocage (new) jails/plugins created in 11.2 can coexist and FreeNAS supports running multiple versions of the same plugins. This allows users to continue to use legacy plugins/jails until they have the opportunity to install and test replacements for their legacy versions using the new UI. While a migration script is available, no script can account for every possible software configuration. If you decide to try the script, bear in mind that you will want to thoroughly test the functionality of the migrated plugin/jail before deleting the original plugin/jail. The recommended method is to reinstall plugins/jails from scratch using the new UI, copy or recreate any plugins/jails configurations, test that the new plugins/jails work as expected, and delete the legacy plugins/jails when everything is working as expected. All other plugins have been tested as working,. Refer to 58482 for the RELEASE plugin versions, testing details, and associated tickets.